A unique monument resides near to Waisai Port, which is called Selamat Datang Monument. The name has the meaning of “welcome”. As the name suggests, the monument has the role of welcoming tourists. As mentioned earlier, the location is near to Sorong Port. The monument is situated in a strategic area, which is in the midst of the street. No wonder, people can easily spot it. Another noticeable thing is related to the appearance, which is similar to a reef island. These days, the monument becomes a favorite spot for photography and sightseeing. In terms of appearance, Selamat Datang Monument has the shape of a small reef. It features numerous colors, which makes it vibrant and attractive. Not to mention many types of ornaments are included. These include statues of corals, turtles, and fishes. There are also two statues of men, representing the people of Raja Ampat. On top of that, there are words “Selamat Datang”, carved on the monument. Below, there are other words “Raja Ampat Kabupaten Bahari”. Plus, some stairs are located near to it, on which tourists can use to reach the top of the monument. For tourists, the monument appears quite attractive. Not only it has a unique shape, but it also emits a cheerful aura. No wonder, many tourists are interested in taking pictures in front of the monument. They want to produce beautiful selfies and show them to their friends, as well. Is it all about photography? Well, people also come to the location to learn the history of such landmark. The fact is that there is a description or explanation regarding the inauguration of the monument. Sorong City is a famous tourist spot in Raja Ampat Regency as it becomes a checkpoint to reach other islands. For those reaching the port, they would see the monument automatically. It is located in the middle of the street, so it can be seen by everyone. Not to mention the location is near to a gas station. Due to this reason, people would drop by in the monument and take an opportunity to capture some stunning pictures of it. In fact, some painters also often visit the location to make a painting. The atmosphere in Selamat Datang Monument is nice. Thanks to the breezy wind. Once tourists explore such famous landmark, they can enjoy other fun activities like fishing and witness local fishermen doing their job. It is true many people in Sorong work as a fisherman, as the sea provides abundant natural sources. Due to its nautical richness, tourists can even see many fishes in the shoreline. 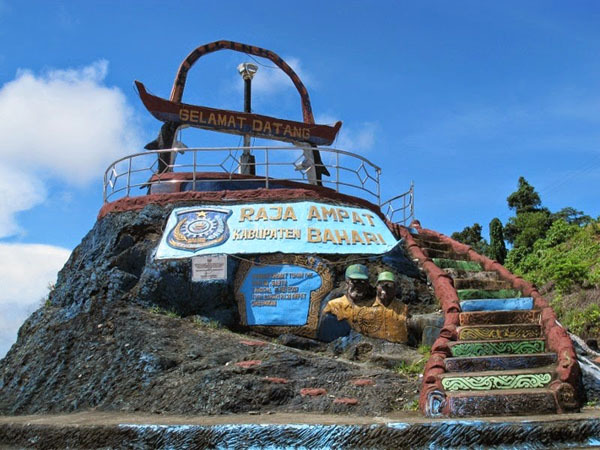 That means the monument represents Raja Ampat and its cities perfectly, which means the region of maritime! Selamat Datang Monument belongs to Sorong City. To be exact, the location is near to Sorong Port. It is quite visible due to its strategic location, so tourists won’t get difficulty in finding it. For those coming from Jakarta, the best transportation service is an airplane. From the airport, they can ride a taxi or minibus and head to the monument.